Los Angeles Transit Lines 3 Line PCC car no. 3022 heads past the Monarch Hotel up Bunker Hill. 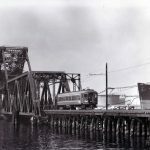 The 3 Line ran between the old Central Station and the Larchmont section of Los Angeles. This car is proceeding west on 5th street. One identifying landmark is located to the right and a little behind the larger building to the right of the 3 line car in the photo, this is a portion of the “tower” of the Los Angeles Central Library. The library architecture is in the Ancient Egyptian motif and the tower is crowned by a pyramidal shape that is partially visible in this photo. 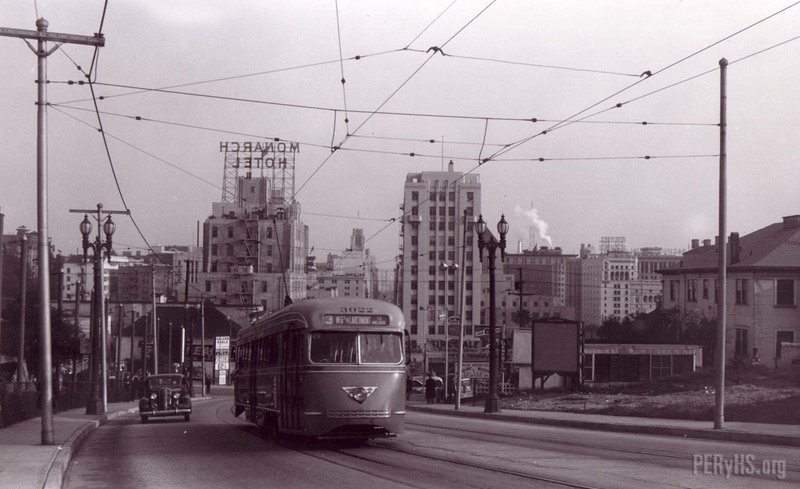 The streetcar is approximately located where the 110 Harbor Freeway crosses 5th street today.